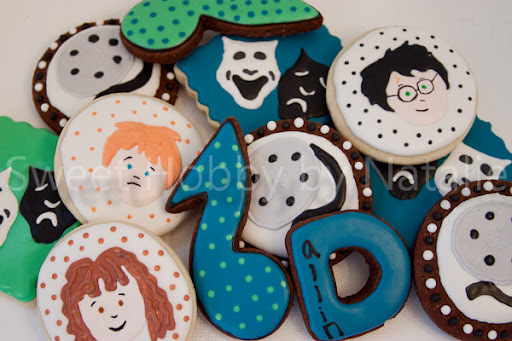 I have had almost two months off from doing cookies for the n/n's, I feel that my cookie decorating skills got a little rusty. But it was a nice break, and now I am getting back into it. I had two nephews here at the end of July and there are a few coming up in August and quite a few in September. Dallin's birthday was last week and he is the fourth child of my brother Robert. He is another awesome nephew of mine, but of course they are all awesome. Dallin is a very talented young man. I remember when I lived in South Carolina and got to visit his family, Dallin loved the opportunity to showcase his artistic abilities. He showed me many drawings and paintings that he had made and he definitely was very good at the young age of 9/10 years old. His love of the arts it still apparent today. 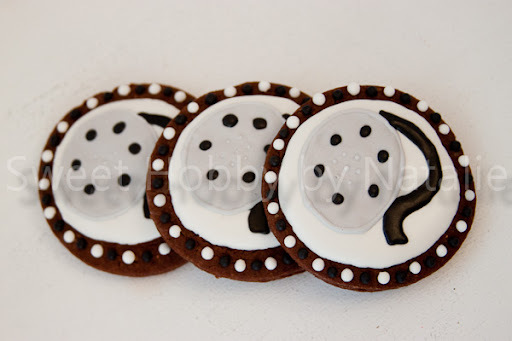 So I decided to dedicate his cookies to the arts. 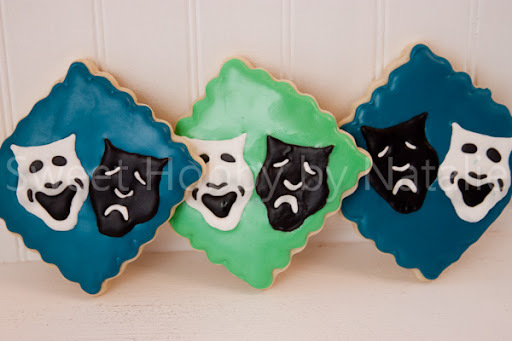 First.... the comedy/tragedy drama masks. Dallin loves to dabble in acting and he even attended an acting school for a semester. One of his favorite hobbies is watching movies, and all kinds of movies at that. So I did some movie reels to show his love of the silver screen. We just finished our home theater so anytime you want to come watch a movie Dallin, you are more than welcome to!! His favorite movies are ones that he shares with his sister, Angela, and frankly his whole family. That is also another memory I have from my visits to South Carolina. All of the Southern Brown Family enjoyed the Harry Potter books. I remember them all reading and talking about how great they were. I think they are the ones that got me into reading them! Their love of the books naturally turned into a love for the movies, but I think that maybe, just maybe, that Dallin and Angela win the title of Harry Potter SUPER FANS! 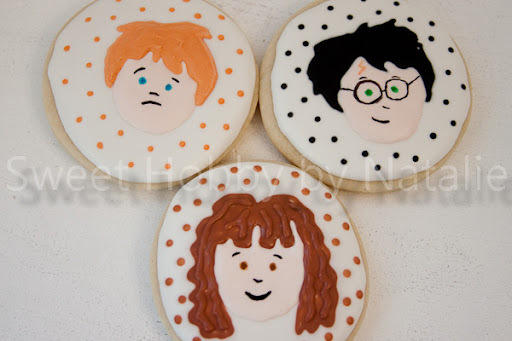 So I wanted to do some Ron, Harry and Hermione cookies for him. And of course another tribute to the arts would be music. Dallin loves music and is a very talented piano player just like his sister Acacia. 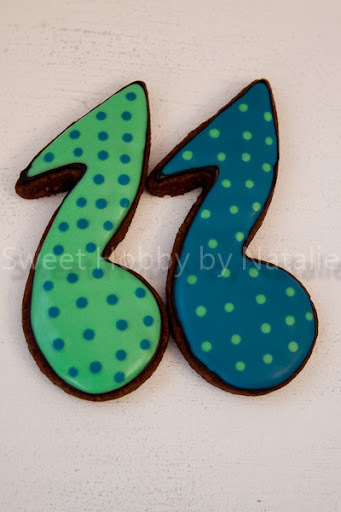 So a couple of music notes in his favorite colors of blue and green are appropriate. Dallin has more talent in just one of his fingers than I have in my whole body, and I am really impressed by this multitalented man. I can't wait to see what he chooses to focus on in his adult life. I am sure that it will be impressive, and I sure hope that he continues to further his artisitic abilities so that othes can enjoy his many talents. Yeah he is. I was including that in with his acting skills but I should have mentioned it specifically. Thanks for adding it.